London's most famous necropolis, Highgate Cemetery has inspired both novels and fanciful tales about vampires. 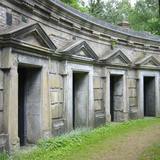 The Victorian burial ground is divided in two by Swains Lane, a steep road leading from Hampstead Heath to Highgate. The eastern half is home to the graves of Karl Marx, sci-fi writer Douglas Adams and Alexander Litvinenko, the Russian spy murdered in London in 2006. The more beautiful, scarier western half can only be seen via a guided tour, which will take you along the Egyptian Avenue - a tunnel pathway done up to look like an Egyptian crypt, as was the fashion in Victorian times - and to the Circle of Lebanon, a ring of tombs around an ancient tree. Amid wildflowers and hanging vines, you will be shown the grave of circus-owner George Wombwell - which is adorned with a statue of his lion Nero - and that of renowned boxer Tom Sayers, complete with a statue of his beloved dog. The tour guides reel off potted biographies that bring the long-dead to life, so to speak. But they also explain the history of the cemetery itself - of its beginnings in 1839 as one of the "Magnificent Seven", a ring of seven huge cemeteries surrounding London and intended to solve the problem of overcrowding in the city's medieval churchyards. After the Second World War, Highgate Cemetery fell into disrepair, and - and this is something they won't be keen to tell you about on the tours - in the 1960s it became the focus of local hysteria about the so-called Highgate Vampire and a magnet for occultists, climaxing in the ridiculous mass vampire hunt of 1970. Though the cemetery has since been restored, landscape architects have been careful to retain its time-worn atmosphere, which was recently captured in the novel "Her Fearful Symmetry" by Audrey Niffenegger, author of "The Time Travellers Wife", who herself once worked as a guide in the cemetery grounds. When: Tours are hourly from 11am-3pm on weekends. Hi Josh, that is such useful info. I've always wanted to go there, but was never sure which graves to look out for. Now that you tell me there's a guided tour, that's great news !